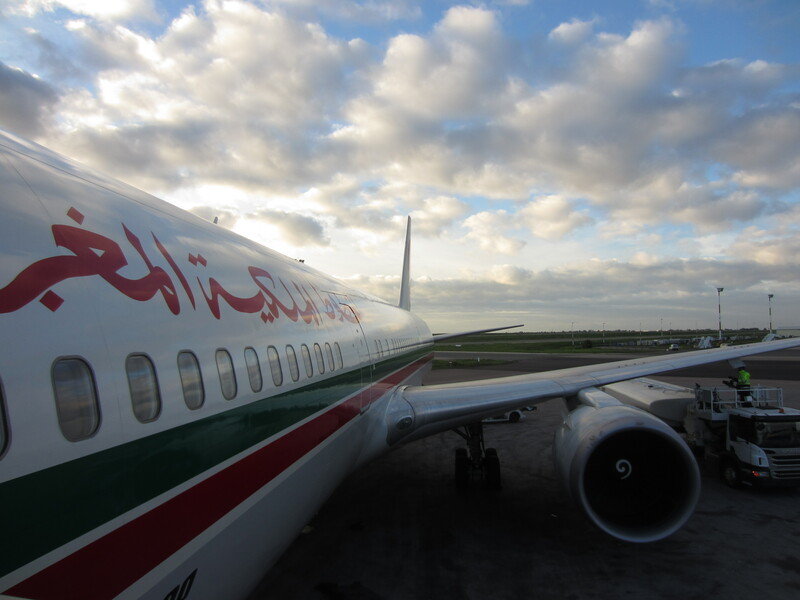 What can you learn about a country from just seeing the airport? It could mean many things. A heart-thumping, sweat-dripping sprint for the gate as you and your travel buddies frantically scan the departures board, and yell directions at each other from across the terminal. A chance to stretch your legs, drink a coffee, complete a crossword and buy some cheap alcohol. A bleak, bleary, red-eyed sleep, curled up on a plastic chair like a newborn foetus, trying to block out assaults of voice announcements and high intensity lighting. The most striking feature of AUH is the big alien nest spawning from the ceiling. It is a pretty airport, with lots of cool conveniences in the waiting lounge, such as long reclining chairs and free computer terminals with internet. I imagined a world of money and spending outside; but with a welcoming, generous attitude. The thick smell of humidity, and the invigorating heat of Malaysia could be felt just walking across the jetway from plane to terminal. What a feeling! Especially after coming out of the airplane’s dry, cold, stale air-con! Inside the airport is a mini-jungle boardwalk, like a biodome. 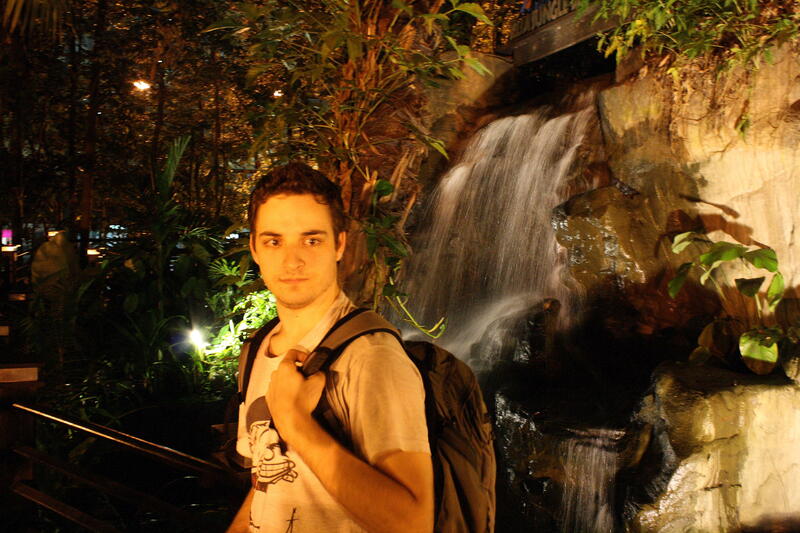 There’s something so infectious about feeling a foreign climate – it instantly made me want to visit Malaysia – which I did, several times! Lots of big, beautiful, golden sculptures! I especially liked the huge sculptures of Buddhist hands mounted on the walls of the airport, with their many gestures. As I suspected, spirituality is a big part of Indian life, and this is reflected in the decor. 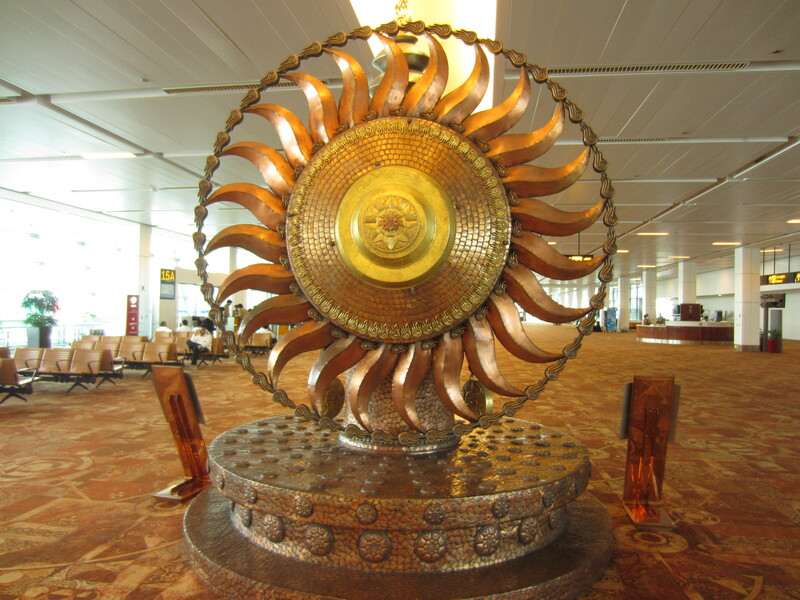 New Delhi’s airport was huge and modern, with many comfortable places to relax. 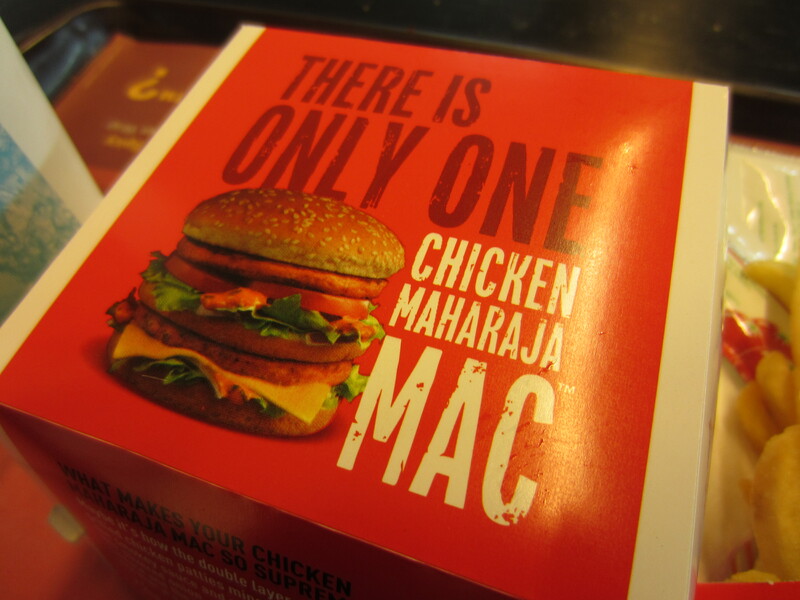 I didn’t get to see India, but I did get to eat a (beef-free) Chicken Maharaja Mac! I was truly hoping to see processions of camels sailing over sand dunes as I looked out of the plane’s windows during it’s descent into Mohammed V. Even some artwork in the airport depicting something like that would have been cool. Sadly, the airport was a large, dull, marble building, and there was very little expressions of Moroccan culture. Besides a few palm trees outside, it looked like an airport as usual. 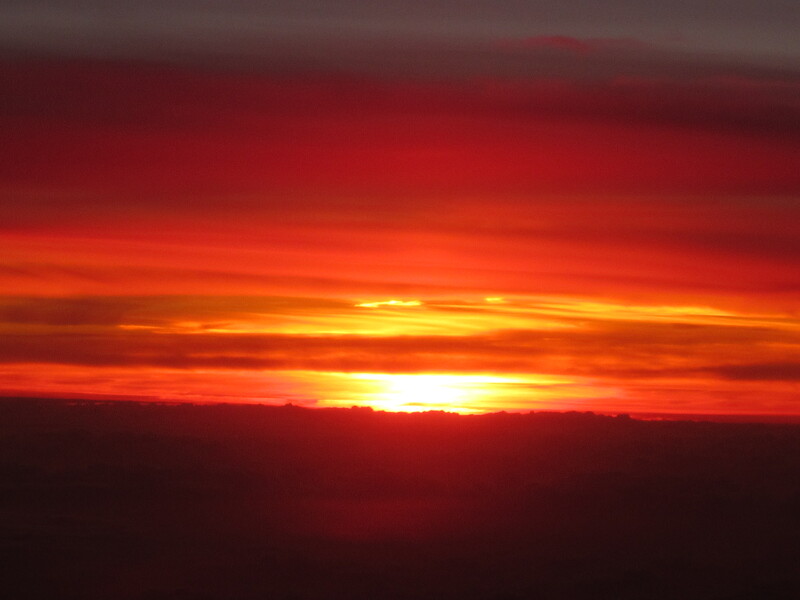 However, as the plane left and breached the cloud cover, I was treated to a spectacular African sunset, a powerful nostalgic reminder of my African roadtrip a few years earlier. Now it felt like Africa. Call me naive, but I didn’t realise how widely spoken Spanish was until we arrived at Miami airport! All announcements were doubled in Spanish, and the staff sometimes greeted in Spanish before English. Given it’s so close to Cuba and the Caribbean, I suppose it makes perfect sense. Large sculptures of fish were presented on the walls, so I figured Miami was a good place to go fishing. American cuisine was well represented here too, such as TGI Fridays (the quintessential heart attack burgers!) and Wendy’s (slightly less greasy burgers). I went for a bagel, sparking a holiday romance with this tough, round, bread-ish thing. Mmmm. Bagel. This was the scene of our mad dash to our connecting flight. With just one hour between the first plane landing and the next one leaving the ground, Cindy and I were getting nervous when it took 20 minutes just to disembark. As the intercom paged Cindy, myself, and another American guy, we expertly navigated escalators, staircases, other travellers and departure lounges. We got to the gate just in time, and the staff smiled and welcomed us on board. Combining that with my experience from Miami – Americans are nice people. Have you been to any airports with any interesting features, or clues to what lies beyond the airport doors? Leave a comment! Yeah I’d like to see it actually, I’ve heard that it’s one of the most comfortable airports to sleep in! 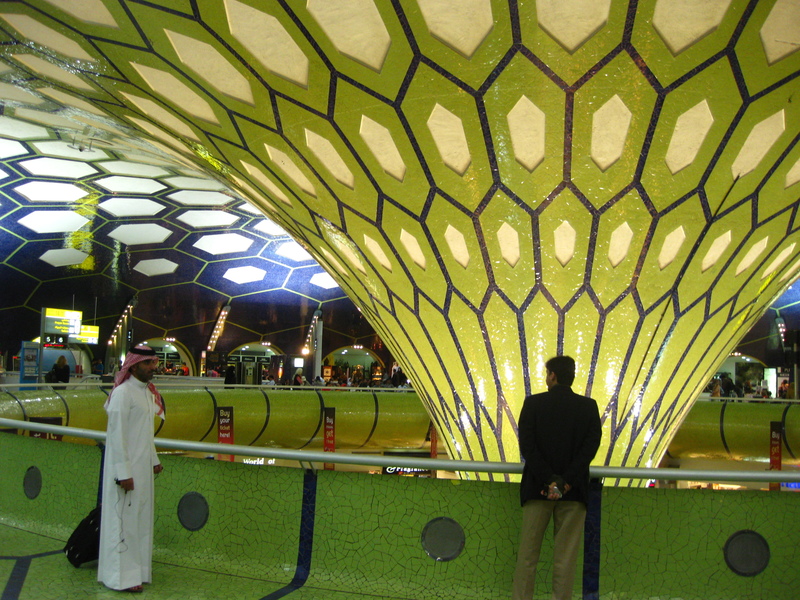 Weirdest airport I have ever been to was Saudi Arabia, in Riyadh! Next ones to try: Denpasar, Paris and Reykjavik!!!! Yeah still lots more to explore!! I remember going on exchange to Japan as a high school student with a group of others from school. When we landed in Osaka airport we were so surprised at how old it was. We were naively expecting a super high tech experience. It reminded me to have an open mind when visiting a new place.